Back in May, Overwatch developer, Blizzard, revealed that kids of all ages would eventually be able to play with Overwatch-themed Lego minifigures, based on the characters from its popular multiplayer video game. Now, the first of these Overwatch minifigures has been revealed: Tracer. 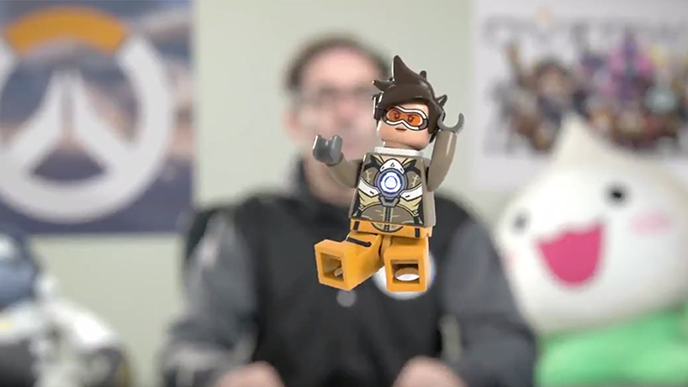 As spotted by IGN, the Overwatch Twitter account shared a brief teaser video that shows off the Tracer minifigure. Like the in-game character, the Tracer minifigure zips across the screen lightning fast, but we do have a chance to see its detailed outfit. Meanwhile, IGN reported that the Overwatch page on the official Lego website has a pile of Lego bananas under the quote “Imagination is the Essence of Discovery,” which are both pretty blatant hints that Winston, Overwatch’s intelligent gorilla hero, will be part of the Overwatch Lego series. The quote is affiliated with Winston in the game’s lore. Overwatch is a popular first-person shooter with teens and adults. The game challenges players to defeat other real players across a variety of in-game modes. This isn’t the first time real-world merchandise has been released for Overwatch fans to enjoy. You can already buy things like Overwatch t-shirts and Funko pops, and a series of Overwatch Nerf guns is also coming soon.